no. BMW M (ex-Motorsport) and BMW Motorad two different organizations. there were no "M" motorcycles, although i have seen evidence of a couple of poseurs with "M" badging and stripes all over their K1200RS's. there is no "performance" brand for the two wheelers. sport models have had a variety of designations, R, RS, S, RR and HP. HP4 is the current street legal race bike. 215hp. 350lbs. OK - delivered everything this morning. It was a cold 38 degrees here in Houston. Brrrrr..
Loaded the Bultaco onto my friend's trailer, and off I went. Houston traffic is stupid enough, and even scarier with a trailer in tow. Even a small trailer. A small bouncy trailer. I had to stop once and make adjustments, as it flopped around a lot back there. Bike never fell over, but close. I need to do more next time with straps to keep it from moving around. Got it up to the shop OK. Andre (the owner) loved it. We talked about what I had done, and what the bike needs going forward. He's got a few projects ahead of mine, but he's thinking a few months and I'll have it back. I told Andre that I've had the bike for 6 years now, and while I don't want it to take 6 years to get it back, a few months won't kill me. Oh - almost forgot - took all the BMW body panels up there. Strip, paint flat black. Fix a small dent in the tank. Put a red pinstripe on the tank. We talked about the pinstripe (shape, width), and got that sorted as well. BMW bike is going to look completely different. Just a quick update, while we are frozen in place here in H-Town - freezing rain and sleet. At one point, I had found a Bultaco sticker sheet. It had tank decals, as well as some other random stuff. One of the random stickers was the Bultaco "Thumbs Up" logo, in metallic silver. The sticker pack had 2 of them. I messed one up, and used the last one on my nicely painted seat. It fit perfectly in the blue stripe. I was very happy. Then, I dropped the bike. Twice. Messed up both sides, causing paint damage, which requires body work and repaint. When I took it to the shop last Saturday, I had given up that I was going to lose these stickers on the seat. They were so hard to come by, I was sad. Then I remembered. A fantastic 02-er, Scott Sislane, has a graphics business. He had made stickers for me before. I e-mailed Scott, and sent him a scan of what I was hoping he could make. After a few days of talking to his graphic designer, new stickers are in process. This time, I have asked for 10. Scott - you and your guys are outstanding! That's great news. Those old stickers are too cool. Scott's graphics guy did a great job. Stickers are fantastic. I called the motorcycle shop last Friday. He has not started on the Bultaco yet, and not started on painting my tin for the R90. I'm a little disappointed, but I guess I need to have patience. More work has been done this year than maybe every other year combined. I was at the shop today. Andre has fixed the shifter - he flushed the transmission and replaced a washer that was missing (whoops) - and it seems to work fine now. He's gone through the engine, and he is not concerned. The parts that need to be painted are out for paint. He has also bought a bunch of wire, and intends to build a wiring harness over the next several weeks. The estimate is that he might be done within the next month. It's nice to see it making progress. Oh - and, the real reason I was up there. Andre found some pinhole leaks in the BMW gas tank. He also found a lot of bondo around the filler neck. The pinholes made him want to strip the whole tank completely and look for more. We thought about trying to find a new tank, but he spent a ton of time getting the inside of this tank clean, it seems like a shame to start over with an unknown. Went to see the Bultaco yesterday. The shop owner got all the parts back from paint, and wanted me to have a look before re-assembly. Maybe another week or two and we'll be done. Thanks guys. I bought the bike in late 2011. I can't believe it's been that long. Quick update. Talked to the mechanic on Thursday. The good news - he got the bike running. The bad news - really bad compression. I had the cylinder bored to the first overbore way back when I was working on the bike. Looks like they did a bad job. My guy had to bore it to the 3rd overbore. I crossed my fingers and called the Bultaco parts guys. The parts catalog lists a 3rd overbore piston and rings, but I wasn't sure if they would have one. Luckily they did. Just gave them my CC# and said ship it. Never got a price. Oh well. Kind of irrelevant anyway, since I need it to get the bike to run. Piston arrived today, along with the gaskets. I'll stop by the shop on Saturday to deliver them. Piston was only $152! Yay! 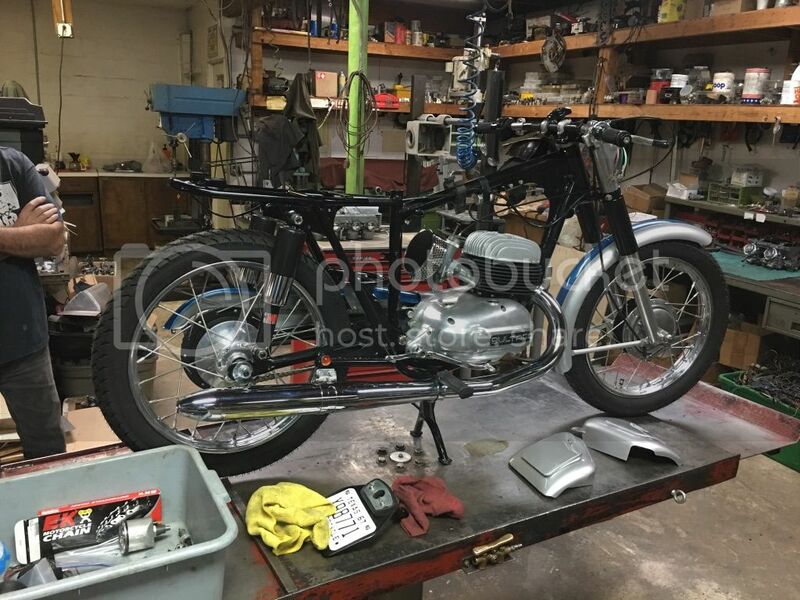 Got a text with a picture of the Bultaco today. It's done. I'll pick it up on Friday. Can't wait. I looked at when I bought it. 10/22/11. Almost 7 years. Good grief.